In July 2009, BNSF 6851 was running long hood forward in Commerce City when an ethanol truck tried to beat it through a crossing. Had it been running short hood forward (with the cab on the front of the train, it's likely that all three of the crew aboard the engine would have died horribly in the massive explosion and fire that engulfed most of the engine. As it was, only one of the crew was injured, spraining their ankle after leaping from the front of the engine. After the fire, the engine was driven away under it's own power. Despite it's stout survival of the fire, it has sat in Globeville near the BN shops, with only the nose of the unit showing that it once was painted BNs Cascade green. Speculation is that the locomotive has sat untouched for the purposes of litigation surrounding the accident. 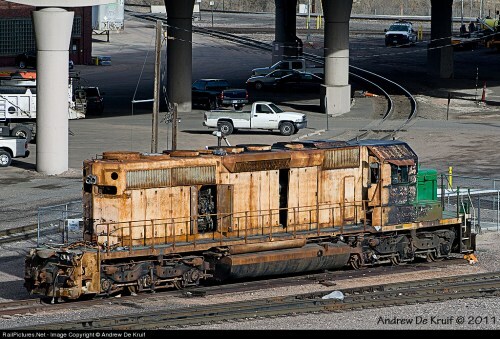 survived a 2009 fire only to sit and rust for years afterward on a BNSF Shops spur track. The SD40-2 is one of the best looking locomotives IMO, and it's a shame to see it in that shape. The fact that is drove away under its own power speaks to the workhorse that the SD40-2's were/are.